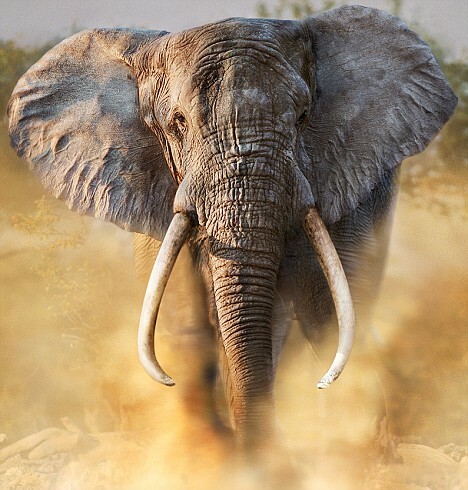 Danger: The African Elephant Under Siege from Poachers! With the poisoned tip of a metal arrow piercing her right leg, a pregnant elephant stumbles miles through the African bush towards her death. After two days of agony she falls to the red earth, while her killers, following on bicycles and carrying butchering knives, wait for the end to come. In the darkness of a Kenyan night, the four poachers watch as she first loses her unborn calf in a spontaneous miscarriage provoked by the poison in her body. An hour later, after the 35-year- old elephant dies, they move in – hacking off her face to steal the two precious ivory tusks which will make them rich for years. Soon, they hope, the tusks will have been smuggled out of Africa and be on their way to a factory in Beijing, to be carved into jewellery and chopsticks. Just a few weeks ago, though, these poachers were caught. James Ekiru, the head ranger at Rukinga Wildlife Sanctuary (which is in sight of Mount Kilimanjaro and two hours’ drive from the port of Mombassa), says: ‘We followed their tracks, and 24 hours after they killed this mother elephant, we found them with the tusks lying on the ground. ‘They were starting to butcher her meat – cutting it into kilo pieces. We arrested two of them, but two more got away. They were local men. ‘We suspect the elephant was killed “to order”, and that her tusks would have been smuggled to China. James Ekiru is on the frontline of a new and brutal war over Africa’s elephants. Today, the fight has caught public imagination following a controversial decision last month by an international committee – which includes British representatives – to lift a strict ban on the sale of ivory. The Convention of International Trade in Endangered Species (CITES) in Geneva ruled that for the first time in nearly 20 years, China should be allowed to buy 108 tonnes of ivory stockpiled in South Africa, Botswana, Namibia and Zimbabwe – countries where elephant numbers are rising so fast in some areas that they are officially culled. The decision has provoked fury. Many conservationists and 148 British MPs have opposed the decision, saying the sale to China will be a death sentence for elephants, because it will ignite the widespread illegal poaching of ivory. Critics argue that the lifting of the ban will make it impossible to tell whether tusks have come from an official stockpile or have been supplied by poachers. So what does the future hold for Africa’s elephant population? Thirty years ago, there were a million elephants in Africa. But in the 1980s, poaching took its toll – and over a period of nine years half of Africa’s elephants were slaughtered for their tusks. Even Kenya, which goes to great lengths to protect its elephants, lost huge numbers to poachers. In 1979, there were 130,000 roaming the bush of this East African nation. A decade later, numbers had dropped to 16,000. At the height of the crisis, in 1989, CITES agreed a worldwide moratorium on ivory sales. Almost immediately, an end was brought to the trade – both legal and illegal – in tusks. In Britain and Western Europe, the use of ivory became taboo, and it was no longer considered acceptable to have a piece of jewellery made from a tusk. As a direct result of the CITES agreement, elephant numbers recovered. Today, there are an estimated 400,000 across the African continent. Predictably, though, the shortage of ivory meant that prices crept up and poaching has returned with a vengeance. At the heart of the problem is China’s insatiable craving for tusks. With 1.2 billion people, it is the biggest consumer of ivory, and over the course of four centuries has enthusiastically traded in African elephant tusks. (Asian elephants’ ivory is not as desirable because it is too brittle for fine carvings). over the years); every home has ivory chopsticks, and hundreds of gift shops are devoted to selling ivory figurines and jewellery. 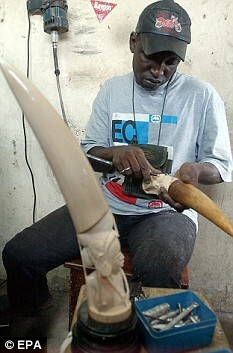 With no legal ivory available after the international ban, an illicit market started to thrive. Black market prices have risen by 73 per cent over the past two years. The rewards are huge. Dubbed ‘white gold’ in Africa, ivory is sold illegally at up to £40 per kilogram, and prices can reach ten times that amount once smuggled to Chinese factories for carving. Every dead elephant can yield ten kilograms of ivory – worth £4,000. In Africa, where corruption is endemic and poverty never-ending, the sums are a fortune and can change people’s lives. Indeed, according to Interpol, tusks are so valuable that Somali warlords send soldiers over the border into Kenya to kill elephants for tusks – and use the proceeds to buy guns. The ivory-for-arms trade is booming in every conflict-riddled nation of Africa. Robert Mugabe’s Zimbabwe regime is exploiting the crisis, too. According to newspapers in Harare, the government sold £850,000 of the country’s ivory stocks illegally as part-payment for a shipment of ammunition and grenades from China. ”] Whatever the precise truth, the catastrophe is growing. Experts at America’s Conservation Biology Centre in Washington DC estimate that 240 tons of ivory are smuggled out of Africa every year – which must mean the deaths of 24,000 of the world’s largest land mammal. Winnie Kiiru, the Kenyan wildlife consultant for international animal conservation charity the Born Free Foundation, which successfully campaigned for the 1989 trade ban in tusks, said this week: ‘There are not enough elephants on the globe to satisfy China’s market for ivory. The decision by CITES to allow the ivory sale to China follows unrelenting pressure from South Africa, Botswana and Namibia – countries where the majority of Africa’s elephants live. They believe they should benefit financially from their elephant herds, and that they deserve to be rewarded for their treasure troves of ivory which have either been confiscated from poachers or collected from carcasses of elephants which died naturally or have been culled since the 1989 ban. On the other hand, other African countries, which have lost almost all their elephants to poachers, are deeply opposed to the trade. While Kenya now has 30,000 elephants, in some of the poorest African countries, elephants can be counted on the fingers of a careless sawmill worker. Senegal, which a decade ago had 20,000, can find only two. In the enormous spaces of Sierre Leone and Liberia, they have just a few hundred apiece. Throughout all of Western Africa there are only 7,500 elephants – a miserable total that is once again falling fast as poaching takes hold. It is the same story in Central Africa. Patrick Omondi, senior assistant director of the Kenyan Wildlife Service, says: ‘The CITES decision last month was wrong. The elephant is in for a very tough time. Others are still more vocal. Dame Daphne Sheldrick, the conservationist who runs a home for Kenya’s orphan elephants (many have lost their parents to poachers) outside Nairobi, said: ‘The decision to sanction the legal sale of ivory to China has potentially signed the death warrant for hundreds, perhaps thousands, of wild elephants. ‘Britain’s support means that Prime Minister Gordon Brown has the blood of hundreds of elephants on his hands. By this deed he will succeed in upsetting the British people – most of whom care deeply about elephants. So can Africa’s elephants survive? Perhaps no organisation can predict the answer more accurately than the Kenya Wildlife Service, which was set up in 1990 to manage and protect the country’s animals, birds and plants. It controls 32 national parks and has 400 rangers armed with the most modern Russian-bought Kalashnikov rifles. The Kenya Wildlife Service says the decision to sell ivory to China is already encouraging a poaching free-for-all. In the past six months, 41 elephants have been killed in their national parks, compared with 50 in a normal year. The animals have been shot with rifles, snared and, increasingly, killed with bows and arrows laced with sap from the acokanthera tree – an African shrub dubbed ‘the bushman’s poison’. The sap contains a toxin deadly to humans and animals, and the arrow technique is preferred to guns because rangers cannot hear them. Since June, nearly 100 poachers of elephants have been arrested in Kenya. Most of the arrests are linked to the ivory trade with China. Nowhere is this more obvious than at Kenya’s main international Jomo Kenyatta airport on the outskirts of the capital Nairobi. Earlier this year, just before the contentious decision to approve the sale of ivory, a Chinese woman was found trying to take four tusks out of the country in three suitcases. ‘She was middle-aged, but had managed to get the heavy cases with an enormous 46 kilograms of elephant ivory to the airport,’ explains Robert Muasya, the KWS head of security. A week later, three more Chinese nationals were discovered trying the same trick at the airport’s international departure gates. They were arrested trying to smuggle 36 pieces of carved ivory. They are thought to have been using Kenya as a staging post, bringing in the figurines, bracelets, blank name seals and jewellery from other parts of Africa and hoping to take them on to China. In Tsavo East, Kenya’s biggest wildlife park, which is the size of Wales, the fight against poaching is at its fiercest. Rangers protecting elephants there have been killed by poachers. 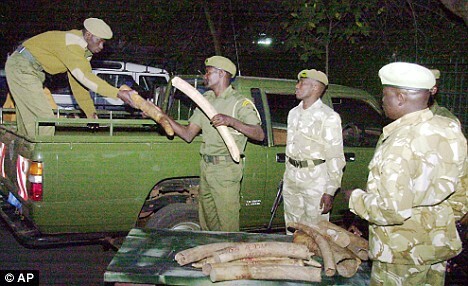 Senior warden Yussuf Adan says a 56-year-old local farmer was recently arrested with 46 kilos of raw ivory tusks that he was offering for sale. The arrest followed a ‘sting’ set up by the wildlife service. An officer successfully trapped the man after disguising himself in Arab robes and pretending to be a trader from Mombassa sending ivory to China. A fortnight ago, a local court sentenced the farmer to four years in prison. Yussuf explains why poaching has become so rampant: ‘The money the farmer would have got for the ivory is enough to feed his family for five years. 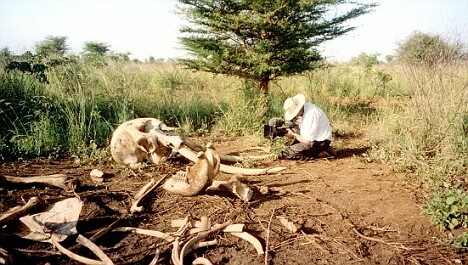 Nearby is a locked store room containing ivory that has been collected by rangers. Each tusk is dated in indelible ink and itemised over ten closely printed pages on Yussuf ‘s desk. The collection weighs 5,000 kilograms – worth almost £2 million if ever sold on the world market. But the Kenyan government says that ivory should never be traded, and rejects the argument used by some economists that if all African countries sold their stockpiles, the market price for ivory would collapse and poaching would disappear. The official policy is supported head ranger James Ekiru’s British boss, Rob Dodson, a former public schoolboy who came out to Africa on his gap year 20 years ago, fell in love with the continent and stayed. The 80,000-acre Rukinga sanctuary, adjoining the Tsavo park and home to more than 1,500 elephants, has lost four beasts in four months to poachers. Only two had been taken in the previous five years. Rob is a committed conservationist and believes China’s greed is jeopardising Africa’s elephants. * To make a donation to the Born Free Foundation’s work providing rangers to fight elephant poaching, go to http://www.bornfree.org.uk or call the hotline on 0870 777 4321. Last summer I spent two weeks in Botswana after being away for 15 years. The elephant population is definitly down. We used to see herds of 300 – 500 elephants. This time the largest group we saw was 34. I was told by one of the chief rangers that the elephants have been migrating north towards Sudan. damn if only there was a group of people who poached poachers for a living……i would pay a hefty price for their teeth. This is awful. But that last comment really hits home. Poachers who poach poachers. I did that in Indonesia. We were protecting the Rhinos, Tigers, and Elephants there. So ya they’re a few of us who enjoy the sport of hunting poachers more than Elephants. they should use it on the people ! I think that poachers are reeeally threatnin’ our unique South African wildlife. Although I’m only 14 , I want to do somethin’ for the animals. I came across this website while looking for info on “The dangers of poaching to SA wildlife” for an English eassay. This site hit home. I’ts really cruel that all these magnificent animals should die for nothin’. Zebras killed only to make a fly swatter of its tail and Rhino’s killed only for the horns! Lots of unwanted animals also gets killed in traps and so! Poachers should be hanged! Ps:Love your site and the fact that SOME people actually care! This was like the first time I really liked doing an eassay! Oh, thanks to your amazing website I got good marks for it! I’ve read these comments up here like 8 times! I would really appreciate it if more people submitted comments. I’d looove to see all these poaching operations fail or to see the poachers behind bars! I’d even PAY to see them there! very sad. but it is fact. lne interesy. Razu jednego Ciekawa usługi dźwigowe. wmawiał samemu, że owo krętactwo. wcięcie, które zaistniało w czasie udeptywania. posłuszeństwa, trzonek skręcił się w dłoniach. – Co otóż to stoisz! – warknął. – Co, zatkało? Mi.